A budget holiday retailer has revealed sunny Spain is the UK's holiday destination of choice this year despite all the action in London over the summer. Holiday Hypermarket says a favourable exchange rate, good deals and short flights have meant areas such as Catalonia, Madrid and Valencia have proved popular, with availability and convenience also major factors. 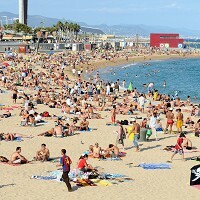 Figures from Spain's ministry of industry, energy and tourism also show these regions saw an 11.1% rise in expenditure in the first five months of 2012, with UK holidaymakers among the biggest spenders, shelling out up to 114 euro per day on top of other holiday essentials such as flights, hotels and travel insurance. "Spain is on our list of best destinations because it's within easy reach of UK airports, served by almost all airlines and travel vendors, and it's well equipped to accommodate high numbers of holidaymakers," said Holiday Hypermarket's e-commerce manager Calum Macdonald.